Rollup security doors are ideal for both commercial and residential applications. Applications ranging from shopping-malls, strip malls, loading docks, and parking garage entrances. Commercial rollup security doors, also known as commercial grille doors can be motorized, chain hoist or hand crank operated. To achieve the highest product quality, the aluminum grille doors are manufactured using solid aluminum bars (rather than hollow tubes) running the full width of the opening. The bars are then connected with vertical aluminum links, with single and double configuration, kept in place with aluminum spacers, resulting in a stronger more reliable door. Our commercial rollup security doors are custom built for each specific application. Rollup grills provide maximum airflow and ventilation while also providing security from un-authorized entrance. Based on your application and usage needs, we offer manual roll up grille doors, automatic rollup grille doors, and high cycle grille doors. For the motorized security doors we offer opening options such as remote control, pull switch or motion sensor. All motorized grille doors come standard with a 3-way wall switch. All commercial rollup grille doors are sold as a kit. All necessary parts are supplied for a complete install. With just a few basic tools, you will find most our doors easy to install. Whether you are putting up a manual or a motorized security door, it will require some type of lifting equipment to place the role in position. It is important to have the roll positioned level and the tracks running parallel with the curtain. Depending on the motor size, a 110 V hookup is typically used. Paylon commercial rollup vinyl doors are specifically designed to provide an economical means of room or storage separation. Some applications that you would most commonly see roll up vinyl doors are; manufacturing plants, warehouse storage, and food preparation or processing areas. Our commercial rollup doors are also well-suited for any passage that has high traffic. Automatic roll up vinyl doors can cycle faster than a conventional steel door, which in turn will minimize temperature loss. Our commercial rollup vinyl doors are custom built for each individual application. Based on your usage the door can be fitted with the properly selected motor for low or high cycle usage. We also can offer manual roll up vinyl doors for applications requiring low or minimal use. Motorized vinyl doors and high cycle vinyl doors are available with different options for operation. Motorized vinyl doors can be opened with a remote control, pull switch or motion detection sensor. A standard up down switch is fitted on all electric doors. All of the doors (manual and motorized) are fitted with a breakaway feature, allowing the curtain to pop out of the track if struck by a cart or piece of equipment. Simply raising the door to the open position will reset the curtain back into the track and become fully functional. Manually operated vinyl doors operate on a spring-tube up to 12’ in height (over 12’ requires a manual pull chain). All industrial rollup vinyl doors are sold as a kit with all parts necessary for a complete install. Most doors are relatively easy to install with just few basic tools. Larger doors may require lifting equipment such as a man-lift or forklift. Keys to proper installation for a manual rollup vinyl door or a motorized rollup vinyl door are making sure the roll is installed level and the tracks run parallel to the curtain. For most motorized vinyl doors a basic 110 V connection will be required. Paylon commercial rollup bug doors are specifically designed to allow maximum airflow and light to non-air-conditioned environments. This includes such applications as manufacturing plants, warehouse storage, food preparation or processing areas. Our commercial bug doors also known as bug blocker doors are also ideal for loading dock areas to assist in keeping out birds, rodents and flying debris. Warehouse bug doors are most commonly used in the southern states which experience a hot summer heat and longer bug season. All commercial rollup bug doors are sold as a kit with all necessary parts for a complete install. Most doors are relatively easy to install with a just few basic tools. For larger doors, lifting equipment such as a forklift is sometimes required. Whether you are putting up a manual bug door or a motorized bug door the key principles are the same. Make sure the roll is level and the tracks run parallel to the curtain. For most motorized bug doors a 110 V connection will be required somewhere close to the door installation area. Our commercial rollup bug doors are custom built for each individual application. Depending on your daily cycles needed, we offer manual roll up bug doors, automatic rollup bug doors, and high cycle bug doors. For motorized bug blocker doors there are different options available for opening and closing the door. Motorized bug doors can be opened with a remote control, pull switch, pneumatic switch, or motion detection sensor. For low use applications the standard wall switch is sufficient. All of the rollup bug doors (manual and motorized) are constructed with a breakaway feature which allows the curtain to pop out of the track if struck by a piece of equipment. By fully raising the door to the open position, it will reset the stabilizer bars back into the track and still function properly. The manually operated bug doors operate as a spring-loaded tube up to 12 feet, and then they operate by manual pull chain. There are a few variables you need to consider when ordering and installing high speed industrial doors. Because there are so many fast roll up doors to pick from (all designed for specific applications), you do not want to end up with a high speed door that doesn’t hold up or is overkill for your specific needs. Paylon is there to help you properly select the right high-speed roll up door for your business. First let’s consider the door opening size. If this is new construction then you need to project the type of traffic that you will have now, and in the near future. Each roll up door does not require much room for 2 empty forklift to simultaneously pass through a doorway, but if they are carrying substantial loads, this will require a wider opening. Now let’s look at how many times per hour traffic will be going through the high speed rollup curtain doors. It may not seem like much, but 15 cycles per hour equates to over 31,000 cycles per year. A standard door simply will not hold up to that kind of high duty cycle abuse. The whole purpose of the fast roll up doors is to increase your production, not to keep your maintenance people busy. Now consider the environment and temperature that your high speed industrial doors will be subject to. Some doors will hold up better than others to dirt and the cold. Also consider if you have adequate space above your door way opening to accommodate the mechanism that holds the vinyl roll up door. Remember, you’ll spend more for this type of door compared to conventional doors but the paybacks are substantial when you choose a high speed industrial door. Industrial roll up doors are stored over the doorway opening in a full length tubular shell. There are two major types of overhead roll up doors, mesh roll up doors and a vinyl roll up doors. The mesh roll up doors are used in areas that require ventilation while keeping out bugs and birds. It can withstand high winds and still cycle up and down. Vinyl roll up doors or rollup curtain doors are designed for fast cycle speeds, they are both easy to clean and maintain. The ideal location for a factory roll up door or sometimes called shop roll up doors is where conventional doors either slow up production or take up too much valuable space. Swing between 90- 120° into both rooms, creating a lot of on usable space. Because of its unique design, when using a factory roll up door there is no wasted floor space. They will take more forklift abuse than a steel door because of their unique breakaway features that protect the panels and track components. Most of our warehouse roll up doors feature the breakaway bars which are designed to pop out of the vertical track if struck by an object such as a forklift. Some applications that utilize factory roll up doors are manufacturing facilities, warehouses, loading docks, and cold food storage facilities. Paylon can offer you different variations of flexible roll up doors to meet the most demanding industrial applications. 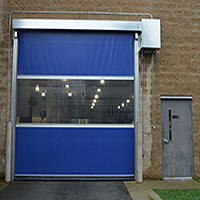 There are several advantages of using these industrial fabric roll up doors over conventional swinging or steel doors. Because they have soft sides, the door can be rolled up at a very high rate of speed. High-speed roll up doors can save a tremendous amount of heat or help retain cold air in applications for cool or cold storage areas. This is especially important when you have several cycles per hour moving a product in and out of storage. When the Roll Up Bug Screen Door is in the down position, it still allows for maximum airflow and ventilation. This allows for cool air to enter the facility and keeps bugs and insects out. The dock bug screen doors come in a power or non powered operation depending on your traffic flow. Powered roll up bug screens are ideal for high traffic on the dock while manually operated bug screens are a better solution for low traffic areas. Both doors are configured as anoverhead roll up doors. This allows for easy retraction, and no loss of valuable floor space. Options are available to convert the bug screen dock doors to vinyl panels for continued use through winter or cold months. Panels are available as see-through or colored. Our high-speed rollup door also has a safety feature which protects the door and operator if contact is made in the partially open position. The door panel can break away from the track with no damage and then be recycled to the home position. Paylon offers this same feature in all of their vinyl rollup doors. Commercial door applications requiring fast foot or forklift traffic are better suited for rollup curtain doors. Because they can cycle up and down at a high rate of speed (in most cases ranging from 3 to 10 seconds) this makes them highly efficient in such places as factories, assembly plants, loading docks, or cooler applications. Rollup curtain doors or sometimes called fast action doors come in different arrangement or classifications depending on your application. Spending more for a high-quality industrial high-speed door is certainly a better investment to maintain a high traffic flow. When you consider 60 cycles in an hour that equates to over 100,000 cycles in a year’s time, there are a lot of factors to take into account. The size, speed, amount of electricity used, and the life cycle of all the wear parts all come into play at putting money to your bottom line. Paylon can help you analyze which high-speed rollup curtain door would best fit your application. Some other products that we carry are the vinyl rollup door, overhead rollup curtain doors and automatic roll up doors. Paylon can help you determine which fast action doors or also called high-speed roll up doors will best fit your application. This type of curtain door is typically used in a non-secured areas because of its soft sides. The investment price you pay will be determined by the size of the jamb opening and the cycle speeds needed for your operation. Paylon industrial high-speed doorscan accommodate high traffic flow, while still maintaining a separation barrier from such elements as Dirt, dust, moisture, cold, heat or wind. Because they are flexible, these fast action doors are can feature a breakaway bar which allows the door to pull away from the track if struck by an object such as a fork truck or pallet jack. You can realign the industrial rollup curtain doors by simply retracting the door to the full up position and you’re now back in business. A conventional door in the same situation could be out of commission until repaired. Call Paylon today and get pricing on our fast action doors. Replace your old and obsolete industrial roll up doors with a new Paylon automatic roll up door. Our reliable and high-performance fast roll up door will start to pay dividends immediately after installation. If your current automatic roll up door is holding up a $30 per hour forklift operator for just 10 seconds per cycle and you have 30 cycles per hour, that means you are losing around $5000 a year in labor production cost. Now factor in the additional electricity saved. In the same application, an industrial high-speed roll up door would have performed the same amount of cycles in 173 less hours (per year). Now that is a lot of electricity. The faster cycle times will also make a noticeable difference in your heating bill. When an automatic roll up door is used in a high traffic area for cooler or freezer storage, this also can be a tremendous savings on your cooling costs. These roll up cooler doors can be insulated and automated to suit your application. They function the same as standard curtain doors but are designed to contain the cold air of the cold storage area thus increasing energy efficiency and reducing your factory energy costs.